Proposes an explanation for why physical evidence of UFOs with an extraterrestrial origin is so hard to find. The modern era of UFOs is now over sixty years old. If we step back as far as we can and view the entire subject with the best possible perspective, one disconcerting fact is rather apparent. We have no hard physical evidence for an extraterrestrial origin. We have some physical trace evidence, but nothing so extraordinary that no other explanation can be offered. We have a vast amount of anecdotal evidence, and some of it is impressive. Jessie Marcel Jr. M.D. springs to mind. He is, by all accounts, a credible person, and he claims to have handled alien-looking materials that his father brought home from the Roswell crash site (2). 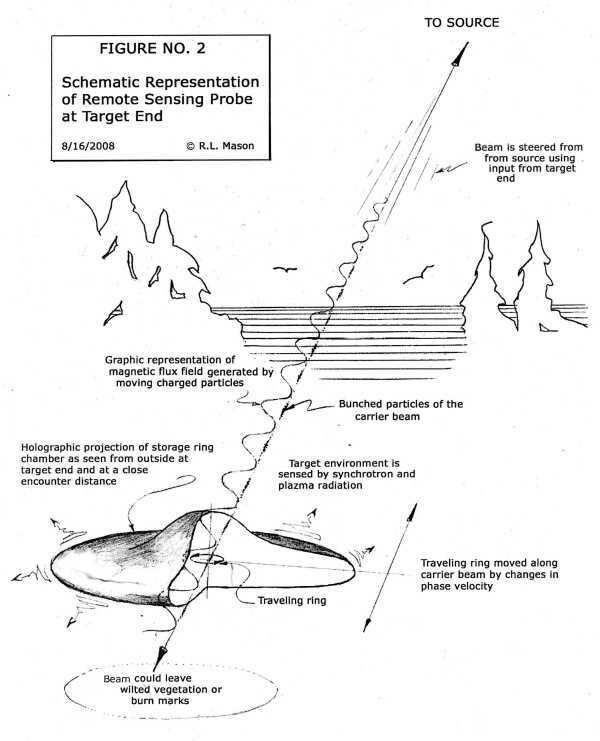 Then there is Jim Penniston, an Air Force Sergeant with top-secret clearance, who says he touched what appeared to be an alien UFO in the Rendlesham Forest incident (4). But despite being credible, these reports are still anecdotal in nature. If the materials that are rumored to have been collected by the military from various crash retrievals actually do exist, and if they were made available for free an open scientific investigation, and if that investigation concluded that there was no possible explanation for them other than they were the product of an extraterrestrial civilization, then we would have hard physical evidence. Just one piece of such evidence would be worth more than all the anecdotal evidence in existence. But that has not happened, and the result is tantamount to the same thing—no hard physical evidence. So, does that mean we are not being monitored in some manner by an alien civilization? Not necessarily. What it could mean is the monitoring process is beyond our technical comprehension. Given current estimates of 13.7 billion years for the age of the Universe and 4.6 billion years for the age of the solar system it is obvious that there has been plenty of time for other civilizations to precede us and, consequently, be greatly advanced technically when compared to us. Can we make any guesses at all about how such an advanced civilization might operate? We can try. • leave physical traces such as burns on vegetation, etc.? In my recent book The UFO Experience Reconsidered: Science and Speculation (3), I argue that a charged particle beam aimed into our atmosphere from somewhere off the planet could, in fact, have all of these characteristics. In addition, if used in conjunction with an advanced capability in the quantum mechanical phenomenon known as “entanglement”, it might enable remote sensing from considerable distances. Exactly how this would work is anybody’s guess. My best guess is illustrated in Figure No.s 1 & 2 below, and is based on a superficial knowledge of particle accelerators. I have extrapolated on today’s knowledge to a high degree and it may be beyond our current ability to judge the efficacy of such a system or something akin to it, but I can think of “no logical or scientific reason” (1) why it would be impossible. A device like this could generate an apparent object in our atmosphere—a virtual spaceship, if you will. There would be very little substance to a craft of this nature. It would mainly consist of a stream of high-energy particles. Its low mass would allow extreme maneuvers. It could leave physical trace evidence and kill the engine of automobiles by inducing a current opposite to that of normal operation. 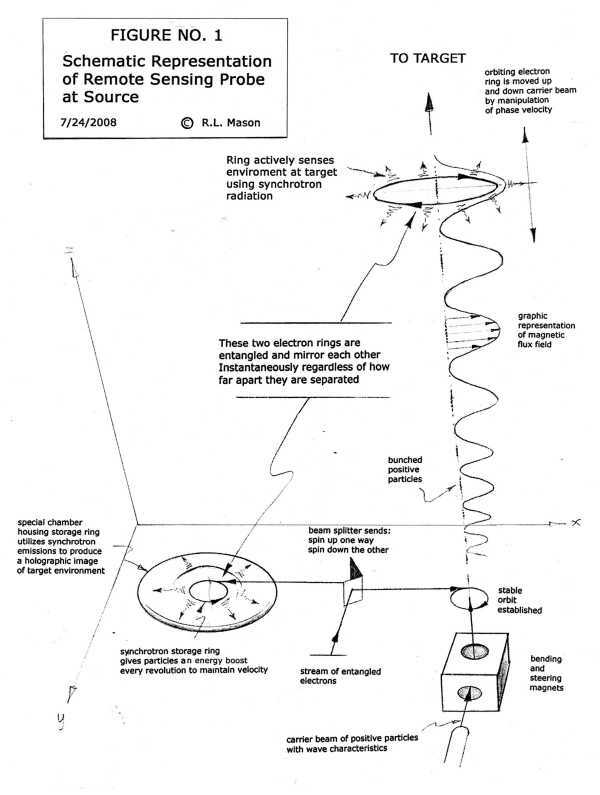 Interaction with atmospheric gasses could cause a visible plasma display that could also appear on radar. It would be completely silent, and it would leave no hard physical evidence. Robert L. Mason is a retired professional engineer formerly registered with the State of California.